Set of 19 cute Wooden Gecko Lizard Cutouts. 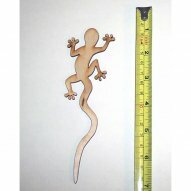 These could be painted cute as the metal gecko wall art. They measure approximately 6" long x 2" wide.